But to tell you the truth, over the past few months I actually haven’t been feeling so much love towards Harav Ovadia. That’s because HaRav Ovadia wasn’t only a great rabbi, a halachic genius, and one of the most successful Jewish outreach rabbis in Jewish history. He was also the spiritual leader of a political party. And in that capacity, a few months back HaRav Ovadia fired some sharp arrows over at my sector of Israeli society—the National-Religious, knit-kippah crowd. And it hurt. So I went from feeling respect and warm fondness for Rav Ovadia to feeling narrowed-eyed fury towards him. This meant that over the past few months, emails would arrive in my Inbox beseeching me to pray for a complete and speedy recovery for Harav Chaim Ovadia Yosef ben Gorjia, and I would ignore them with smug vengeance. And then I attended the parent-teacher meetings at my kids’ knit-kippah schools last week, and in all four of my children’s classrooms “Harav Chaim Ovadia Yosef ben Gorjia” was written in large letters on the whiteboard so the kids would pray for his recovery. So as I chomped on a piece of pizza after 4 brain-numbing back-to-back parent-teacher meetings, I thought about all those proud Israeli knit-kippah-niks forgiving Harav Ovadia for the sharp arrows he had sent our way, and I thought about how “a person who overcomes his anger, all of his sins are forgiven,” and I decided I would try to forgive Harav Ovadia too. Well, not really forgive him…I mean how could I ever forgive him after he said what he had said? But at least I would pray for him. So I put my pizza down on the tray, and whispered, “Please bless Harav Chaim Ovadia Yosef ben Gorjia with a speedy recovery.” And then I picked up my pizza again and continued eating. And I looked around me and saw that the women around me were crying. And more surprisingly, I was crying too…Maran, don’t leave us. Hashem, please have mercy. And that whole morning I walked around with a heavy heart… I told the cashier at the health-food market and at the stationary store to “pray for Harav Ovadia, his systems have collapsed” and they promised that they would. And after Harav Ovadia was called to the Yeshiva shel Maalah at 1:32 PM, I spent hours listening to the radio eulogies of Harav Ovadia, including the one from Harav Yaakov Ariel, one of the leading rabbis of the knit-kippah world, who proclaimed, “Everyone calls him “Gadol Hador,” the greatest rabbi of the generation, but it’s not true. 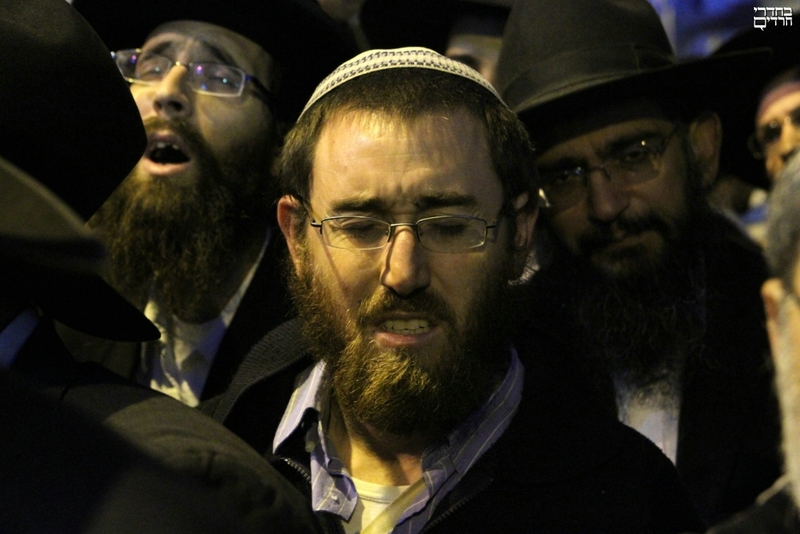 He was the “Gadol HaDorei Dorot,” the greatest rabbi we’ve had in many generations!” And I was crying, as I did yet again when I stood among the 850,000 last night to pay my final respects to the rabbi I had so recently been so angry at, and now loved. The funeral was an awe-inspiring event I will never forget for as long as I live. 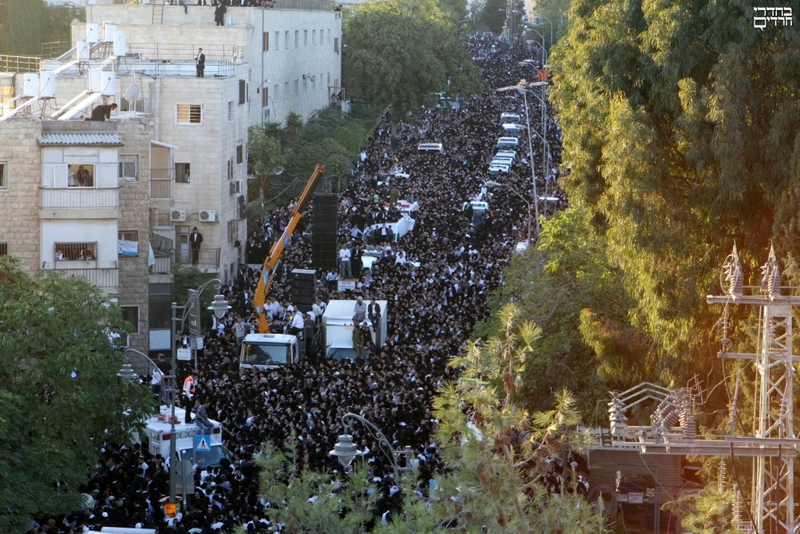 It wasn’t only attended by Sephardi Charedi Shas-nikim. And it wasn’t only attended by the Ashkenazi Charedim. And it wasn’t only attended by the religious and traditional Sephardim who revered Harav Ovadia like a king. There were also many Ashkenazi knit-kippah-niks, like me, who had felt the sting of those sharp arrows a few months ago, and decided that just like your father sometimes gets angry at you, and you still love him, the same was true of Harav Ovadia zts”l. To me, the funeral felt sort of like standing at Mt. Sinai yet again. But instead of receiving the Torah, we were standing together to honor a man who was Torah. PLEASE NOTE: I AM MONITORING COMMENTS ON THIS POST VERY CAREFULLY, AND WILL NOT BE ALLOWING COMMENTS THAT ATTACK ANY INDIVIDUALS OR SECTORS OF ISRAELI SOCIETY. THANKS FOR YOUR UNDERSTANDING! 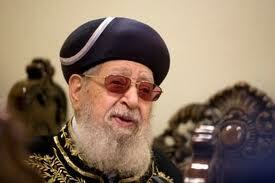 He should be a meilitz yashar for all of klal Yisrael! You took the words right out of my mouth, but i’d like to clarify that it happens many times that a great Rabbi’s words are taken out of context and used to promote the speaker’s own interest. There is a story of a great Chareidi Rabbi who was asked, “why don’t you speak about the teachings of HaRav Kook?”, to which the Rabbi answered “…they [askanim] don’t let me.” I don’t believe Rav Ovadia actually threw poisoned arrows at the knit kippa club, I believe that his words were interpreted into arrows by those with motives to do so, and that is why I did daven for him with fervor even though I too was very hurt. Thank you, JewishMom. I have also been having a real hard time with the internal dissonance at this time. Your article surely helps salve the wounds a bit. It seems like he was a complicated person. However, the outpouring of grief reflects the impact he had on Israeli society, and he certainly made an indelible contribution to the halachic world. THANK YOU!!!!! Someone.needed to say all of this. Baruch Hashem you had the azut d’kedusha to do so. Such a genuine message of emunat chachamim and ahavat yisrael. Thank you! i agree with you so much. i was also wounded by some of hte things he has said recently, but i reminded myself that a. he was getting old (even gedolim get old, and weak, and less in control) and b. i, sadly, have for many years stopped believing anything that i am told a gadol ‘said’ or ‘forbade’ or ‘opposed’, unless i am hearing it from the person who heard it from said gadol’s own lips, because the gedolim (who were sadly also all ageing and no longer as strong as they once were to assert themselves publicly) were all monitored by askanim and gabbaim who filter what reaches them, and filter what comes out. and, in the case of rav ovadia z”l, he was always fiery. i think that, just like we might have a friend who speaks harshly and passionately, but we loveh er anyway and overlook her harshness because we know ‘;it’s just the way she is’, it was the same with rav ovadia, that it’s just hte way he was, just hte way he would express himself, and wihle i felt the pain of those sharp words, i reminded myself that it’s just him. he probably did not feel the words to be as sharply painful as i did. My husband has often pointed out to me that when we hear things said by gedolim (whether or not they actually said it or whether we hear it out of context, as pointed out in the comments, is another issue) we have to understand that THEY KNOW HALACHA and they what they are doing… they know what is lashon hara and in what cases it’s permissible to speak. It can be very difficult to understand (myself included) how it is permissible for them to say certain things but gedolim like Harav Ovadia live and breath according to halacha. They are not saying them “stam” or just to be vengeful. this really moved me. thanks. Jenny, I’m quite impressed by your strength to overcome your feelings and even more by your candid-ness in sharing all this. Kol Hakavod! I don’t know the exact statements that he said, nor do I want to, but for the sake of judging favorably, I have found that many times the media publicizes these statements out of context. Thank you for your touching and honest account. It was so beautiful. I don’t know what the Rabbi said, and I don’t want to know. I am Sephardic and wear a Sheitel and I am sure he would not have liked that. Who knows what he would have said to me had he seen me. Will I have ever forgiven any comments? However, I can assure you that you overcoming your feelings and having the gevura you had to pray for him regardless is really amazing. I am sure he is now facing the eternal truth and his great neshama is rejoicing . One thing is for sure…we have all said things that offended people before, but I doubt we get this many people to daven for us when we are sick and to pay their respects at the end of our lives. He will be greatly missed. I am a very proud “Sephardi” “Tzioni”. I am proud to be a reliious zionist and at the same time proud to follow halacha according to the rulings of Rav Ovadia Yosef ztz”l. At times it felt like there was a clash but that’s when I was reminded that these definitions are limiting and being a Jew is greater than that. 3)being that I am so busy much of the time caring about what people think of me, I think I learnt from Rav Ovadia Yosef ztz”l how to speak your truth without getting caught up in what others may think. BTW Jenny, you felt like it was Mt. Sinai. I felt it was a taste of what it would be like when we get word that Mashiach is here. Amen b’karov! Awesome article. I didn’t even know he died until 7 hours later – I LIVE in Israel! When it hit me, I just stopped and caught my breath and started crying. I don’t know why I cried exactly. I just did. I then even though I was completely exhausted watched some up-loaded youtube clips from the levaya .. and then a 4 part series I found on Youtube about him.. and cried some more. I cried myself to sleep. I woke up .. it was as if nothing had happened. Israelis are intense that way. Or maybe we’re just the microwave generation. For me all was forgotten when my 11 yr old daughter came home devastated and awash with tears, sobbing “harav Ovadia died” and then crumpled into my arms. I wondered in awe as we sat there, tears pouring down our faces, mine for this reason: how did I, such a stubborn baalas teshuva, merit to have a daughter who cries real tears over the passing of a gadol? What was I thinking of at her age… I was overcome and for me, that was the first time, through my daughters pure pain, that I cried for the first time ever over the passing of a gadol. And I really meant it. The soul knows, even if the media doesn’t. your words really hit home. thank you for sharing. you have changed my (faulty) thinking on the matter. thank you for inspiring some cheshbon hanefesh. I like your site, but this post really upset me because of the insensitive, chutzpadik title. Forgiving the Gadol Hador? Seriously? Can you picture someone writing an article “Forgiving Moshe Rabbeinu” after Moshe Rabbeinu’s petira?